Your ability – or inability – to deliver on time can adversely affect your customer’s project. Miss a delivery window and you damage your relationship. Scheduling equipment deliveries and pick-ups doesn’t have to be a nightmare. RMI offers three methods of managing Rental Order fulfillment. Simplified Method – In this method, standard reports identify workload for both outbound and inbound rental activities. Rental Service and Dispatch – In this method, ADVANTAGE provides the dispatcher with the tools needed to assign work tasks (deliveries, pickups and services), and vehicle routes. Rental Work Orders – In this method, ADVANTAGE delivers a more robust approach to order fulfillment that includes managing outbound and inbound activity through Picking Tickets, Packing Slips, Return Tickets, Return Merchandise Authorization (RMA) tracking and audit trails. 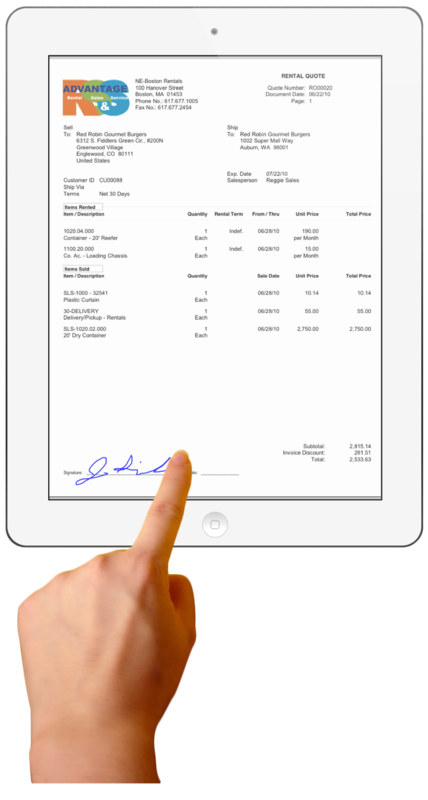 Now that you have managed the scheduling, the ADVANTAGE Mobile User collects electronic signatures and updates your contracts with delivery and return confirmations in real time. Increases customer satisfaction since their projects rely on timely delivery of equipment from you. Making it a Win-Win for everyone. Watch the ADVANTAGE Rental Delivery video for a demonstration of Rental Work Orders and Mobile Users in action. November 26, 2013 in About ADVANTAGE, Did you Know?, Rentals, Solutions to Industry Challenges. ← I hope this never happens to you but, if it does………..